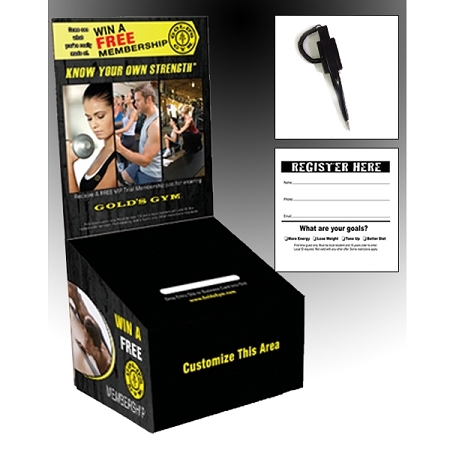 PRE-DESIGNED GOLD'S GYM LEAD BOX with a slanted top. Provides maximum visibility with the least amount of counter space and sets up in seconds.The header and box are pre-printed. 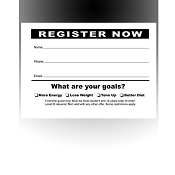 We will customize the Footer for your club. This package comes in a pack of 20 and the shipping is already included! In the comment section when checking out, just type your club info as you would like it to appear. Don't worry if you make a mistake. We will send you a proof before finalizing. Free shipping in USA only, HI and AK are excluded.